Infinity Overture is the project of exceptional Danish guitarist Niels Vejlyt. His debut work Kingdom of Utopia is a massive work of symphonic power metal which can only be described as epic and sweeping in grandeur. But this is what Vejlyt hoped to accomplish in the first place. Even a cursory listening to Kingdom of Utopia shows there is no middle ground for Vejlyt in his compositions. Every song is ambitious and sweeping painted by mammoth arrangements filled with Vejlyt's guitar prowess, layers of lavish keyboards, and huge vocal arrangements. Actually, it may be that latter attribute which steals the show. Vocalist Ian Parry (Consortium Project, Elegy) is complimented by the beautiful voices of Lene Petersen and Anne Karine Prip to provide a strong performance that catapults Kingdom of Utopia as much as the music. For Vejlyt's participation, he applies his profound fret skills with acumen and creativity without overindulging his obvious talent in neo-classical wiggling. Conversely, there are many times throughout this album where the same arrangements that propel the energy become redundant and quite predictable. 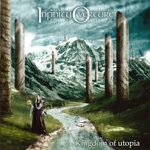 Overall, Kingdom of Utopia, even with it's often overwhelming bombastic grandeur., succeeds as a powerful first work of symphonic power metal for Niels Vejlyt and company. Best cuts include The Great Believers, Queen of Hearts, and Temple of Doom. Recommended. Kingdom of Utopia, even with it's often overwhelming bombastic grandeur., succeeds as a powerful first work of symphonic power metal for Niels Vejlyt and company.